Uplift your workforce, amplify their energy and build more open, connected teams. Culture is simply the culmination of all the behaviours exhibited in an organisation. By recognising and encouraging specific behaviours we reinforce the things that make a positive difference in our lives and ensure they continue. Over time, what you recognise helps shape the environment you work in. Teamphoria provides an opportunity to recognise the small or large things that people do which have a positive impact on you, and at the same time learn all the things that you do which make a real difference to others. 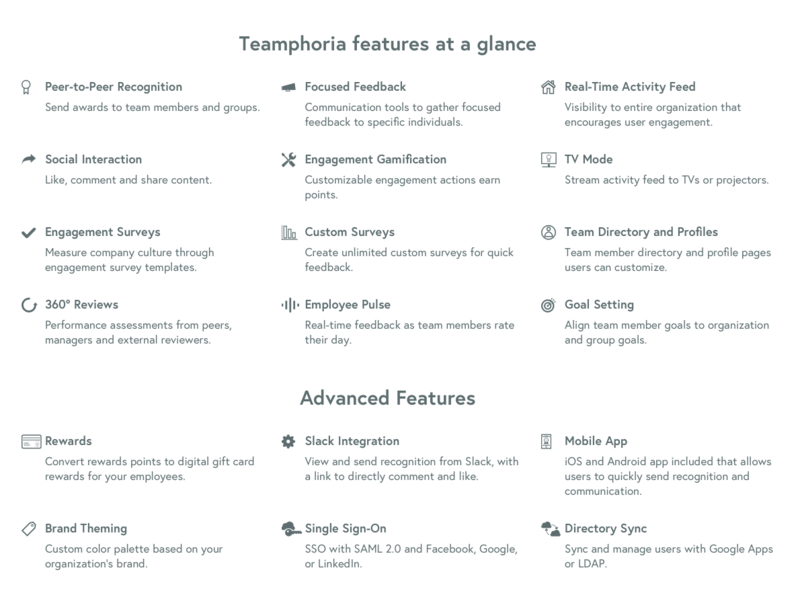 Teamphoria also provides a suite of tools that allow you to request feedback, make suggestions, anonymously vent about something troubling you, rate your day, take an engagement checkup or even run your entire performance review process. All presented in a simple social environment with powerful analytics and visualisation tools so everyone can see exactly how the culture is tracking against the company’s own values. 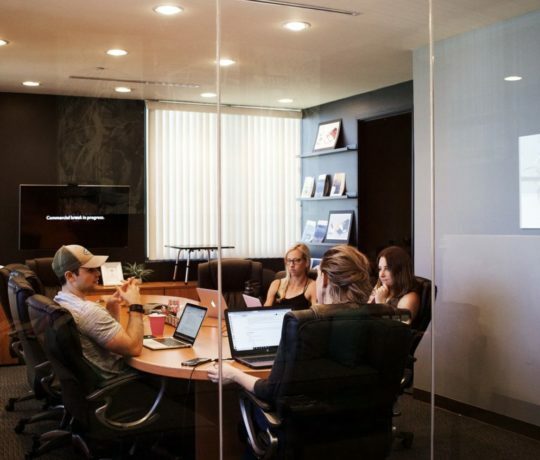 How does creating a positive, thriving company culture impact your bottom line? Offices with engaged employees were up to 43% more productive. Why use a recognition platform in your workplace? Continuous culture management and employee recognition. 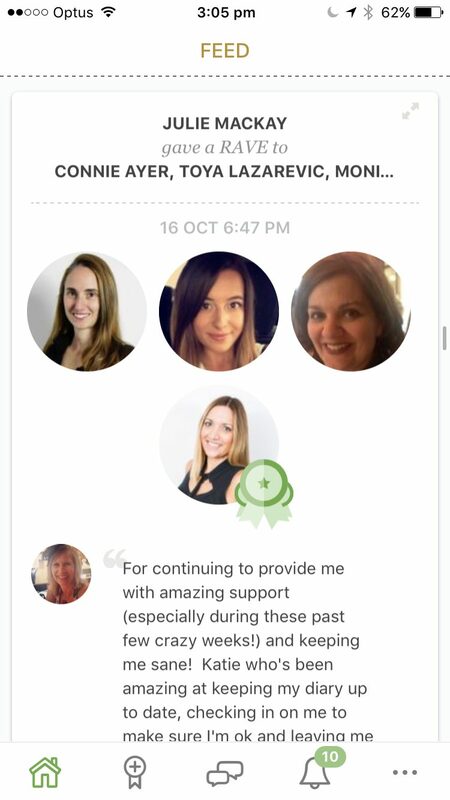 Everyone can send and receive recognition: peer-to-peer, manager-to-employee, employee-to-leadership.  Choose from our four award levels: Silver, Gold, Platinum and Group. Through our leaderboard, you can track your recognition movement and identify top performers. 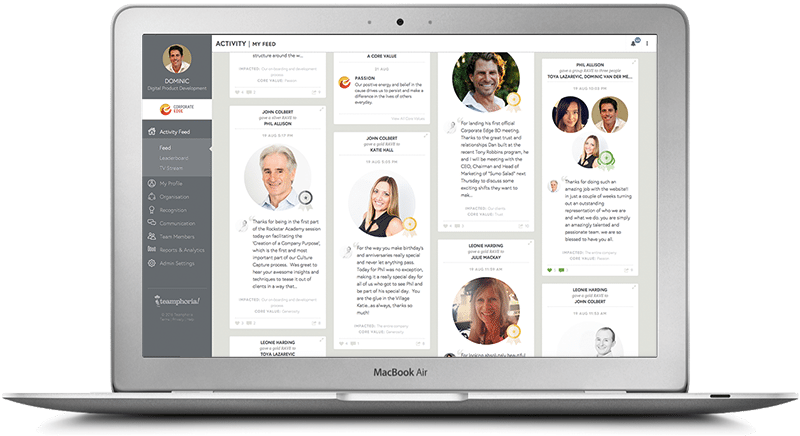 All recognition is shown in real-time through the activity feed. Engage customers and guests by allowing visitors to send and receive recognition, too. 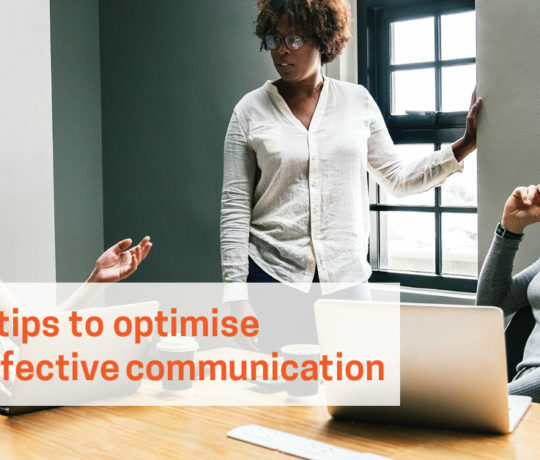 Creating a culture of open, clear, and transparent communication is a daily struggle for every organization. With Teamphoria, you can define and manage communication channels between team members and leadership in one place. 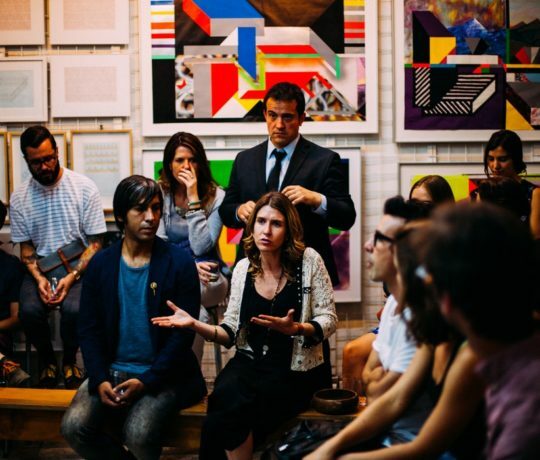 Give team members the tools they need to know how and when to communicate with leadership through Ask a Question, Vent a Frustration, and Make a Suggestion. 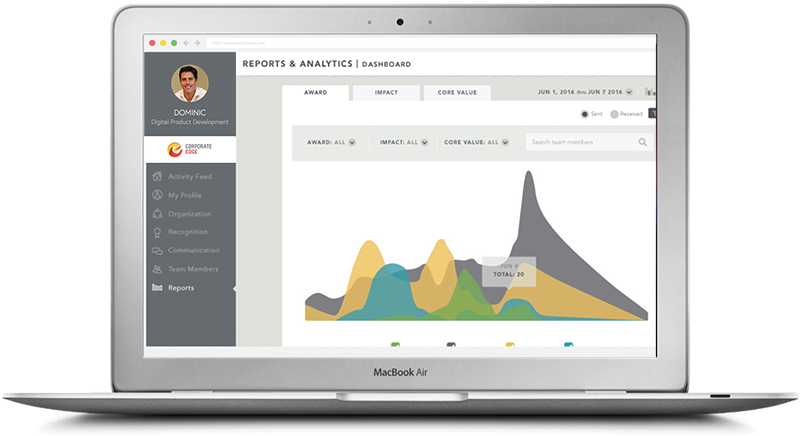 Rate Your Day allows you to keep a pulse on your entire organization by collecting daily statistics on happiness ratings. Reviewers have access to review and reply to all communication types in one place, with filters and keyword searches to help organize and manage. Our communication tools are completely flexible to meet the needs of your organization. Build your own modules, forums, or message boards by updating the language, icons, and permissions. 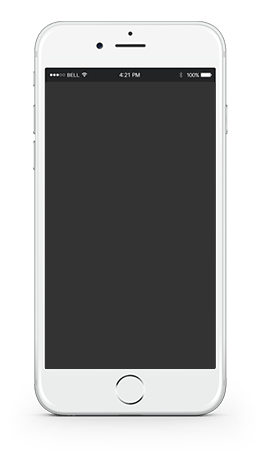 All communication types can be toggled on or off at anytime to make sure you are collecting the right information at the right time. For each type of communication you can control posting, viewing and replying options. Administrators decide if users can post anonymously and who the posts are visible to within the company. Create unique groups for viewing and replying to communication to ensure the right eyes and ears have access. Ditch the pen, paper, and boring spreadsheets. 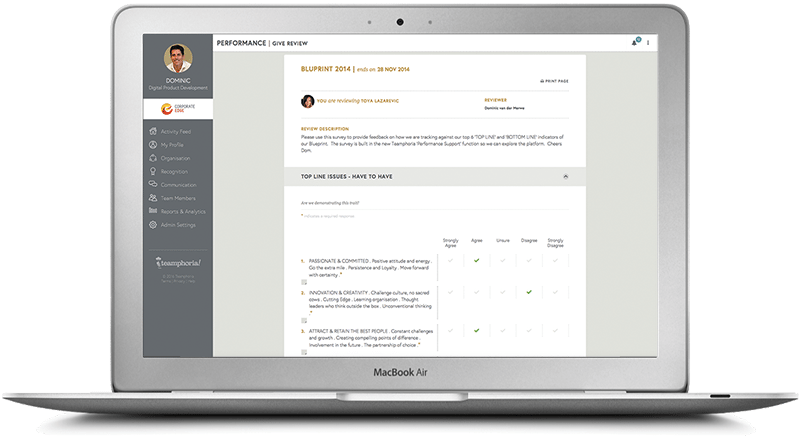 With Teamphoria, you can manage your goal setting and performance review process online, saving paper and your time! Design the perfect annual reviews for your organization. 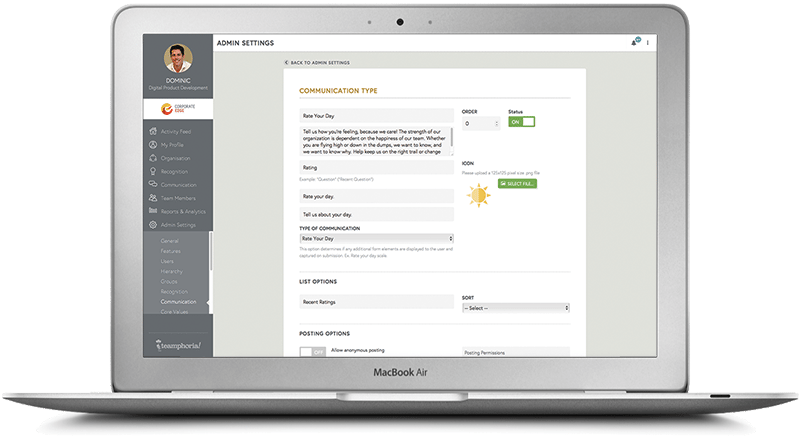 Everything is customizable including the content, question type, and response visibility. 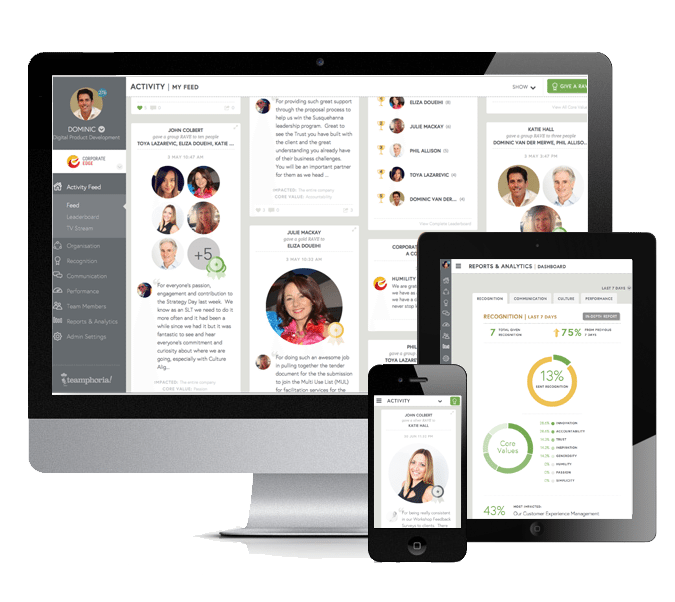 Employees can quickly access their reviews via a link from their email and have the ability manage their own, peer, and manager reviews in one place. Managers decide when the results are released, so they can hold until completion or a particular date. With Teamphoria, employees can set professional and personal goals which are then shared with managers. For each goal, team members set due dates and milestones to determine if they are on track to achieve their target. 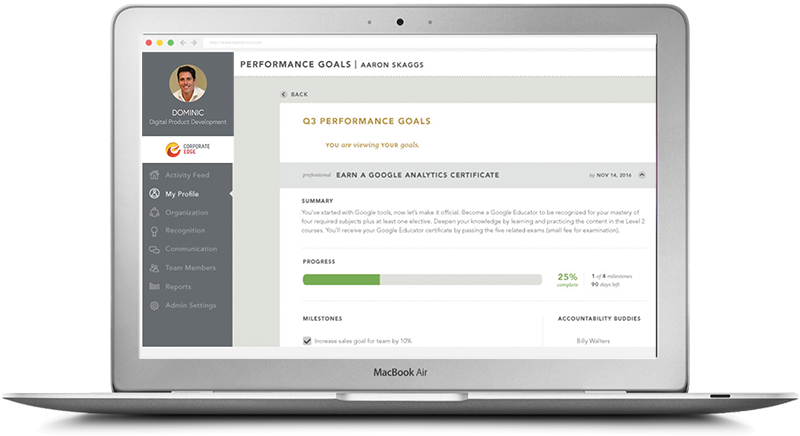 Assign accountability buddies for each goal who can encourage you and give feedback on your progress. 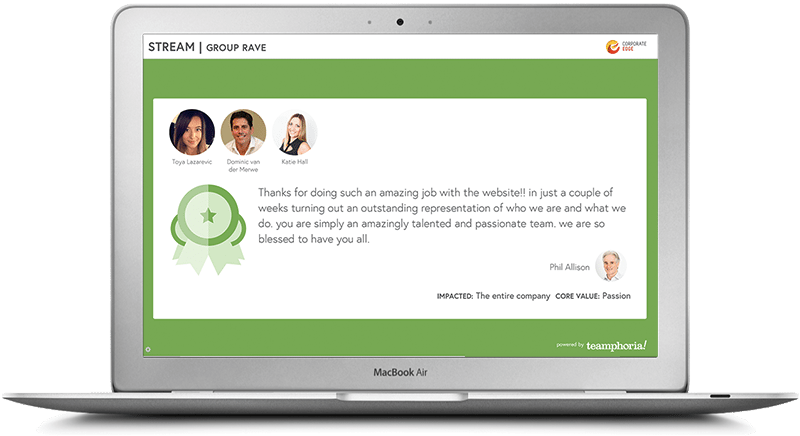 Team members can compare their self, peer, and manager reviews side-by-side on one screen. 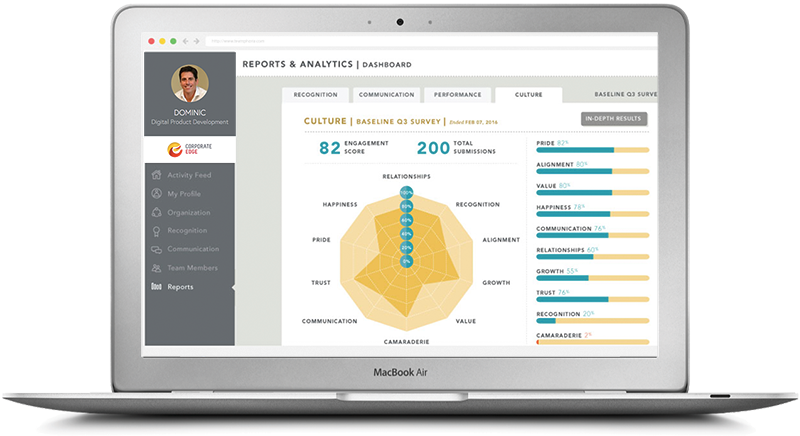 The HR dashboard shows completion rates and review statuses to administrators in real-time. Past reviews are archived to keep your organization compliant. They can easily be accessed at any time.